Sewing supplies don't stop at needles and threads, but many other sewing necessities often go unnoticed. Notions such as scissors, snips, and bobbins are a staple for most sewers, and stabilizers are a must-have for almost every embroiderer. 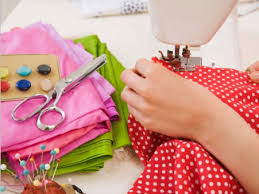 Other sewing supplies that often slip under the radar are furniture and machine bags or luggage. While neither furniture nor luggage are used to finish a project, both are commonly found in the homes of sewers. 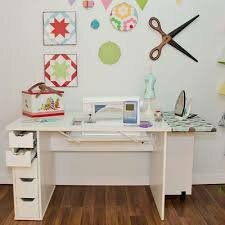 Whether they own sewing, embroidery or quilting machines, hobbyists and entrepreneurs alike need a place to store machines. A stylish sewing cabinet is a great way to store a machine while keeping a room looking beautiful. Additionally, machine bags and luggage pieces are handy for traveling sewers. Whether traveling long distances or simply going to a nearby class, it is easier to travel with an appropriate bag. Below are some of our favorite suppliers for notions, furniture, luggage and fabrics. HORN CABINETS: Horn Cabinets are dedicated to providing you with the best sewing furniture at great prices, made right here in the USA. Moda Bakeshop: Moda Fabrics is an industry leader in fabrics, notions, patterns. Offering free patterns and projects to inspire and challenge. Camelot Fabrics: Camelot fabrics offers fun, fresh fabrics. Distributor of Quilt shop quality licensed fabrics from Disney, Marvel, Star Trek, Star Wars, and Warner Brothers. Free Patterns Available. Quilting Treasures: Employee owned company proudly carrying quilt shop quality fabrics. Exclusive distributor of fabrics featuring the Secret Life of Pets and Minions. Free patterns available. Ink and Arrow Fabrics: Newest division of Quilting Treasures, Offering fun, modern fabrics with whimsical projects! Anita Goodesign: Supplier of Premier Embroidery designs and projects. Every design is hand digitized so you get perfect results every time. Floriani Embroidery: Supplier of Embroidery designs and supplies such as stabilizers, threads and notions. Floriani the name that means beautiful quilting and embroidery. Husqvarna Viking: Manufacture of machines since 1872, Husqvarna Viking has been an industry leader introducing the world's first zig-zag free arm machine, the world's first computerized sewing machine and the world's first embroidery machine designed for the home sewer. Let your imagination take flight! Pfaff Sewing: For over 150 years, PFAFF® has developed premium sewing machines distinguished by their sophisticated appearance, superior performance and exhibiting ultimate design freedom. By 1910, Pfaff had already manufactured and sold 1 Million machines; It only took 40 more years to reach 5 Million sold. 1968, saw the release of the first machine with IDT (Integrated Dual Technology).